I come from a big family; I have eight siblings and I am the youngest. My mother told me that my father remembered only my eldest sister’s birthday because she was his first-born kid. And I will use this as an analogy to M/Mink. I remember it as my first true love to niche perfumes for it has given me much surprise and disbelief. So let me describe what M/Mink smells to me. It smells like Chinese calligraphy ink and sun-dried seafood. Both are part of my childhood, believe it or not. When I was in primary school, we had had Chinese calligraphy lessons. Every week I would bring my brushes and a semi-leaky ink box with a screw-on lid in a plastic grocery bag to school, and inside the ink box there’s a big piece of cotton soaked with ink. I don’t know what ink is made of and what makes it smell that way, but the smell has forever been etched in my brain as one of my childhood scents. Calligraphy lessons were both fun, dirty and messy; they provided me necessary breaks from some of the regular academic lessons that I couldn’t catch up with. M/Mink also smells of sun-dried seafood, which is inseparable from traditional Chinese food culture and ancestor worshipping rituals. (Yes, a few decades ago it was completely normal and grand to gift a wedding couple a box of sun-dried sea scallops.) When squids, octopi, abalones, sea scallops, shrimps are being sun-dried, they release a very pungent fishy sweetness, almost like honey. I remember walking down a street in Hong Kong with a nickname “Seafood street”, and it just reeks. Not a dirty, bloody butcher shop kind of reek, but a dense salty and sweet, oceanic smell. 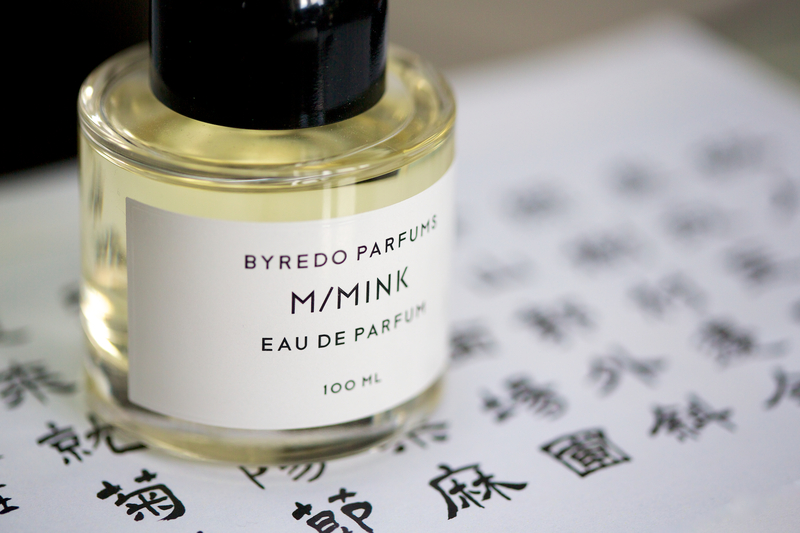 M/Mink has a heavy dose of beeswax, which is considered very animalic, may be that’s why it reminds of sun-dried seafood. The combination of ink and seafood smell is just crazy but I yearn to wear this scent whenever the weather starts to chill down. I have just written more than I typically do, and interestingly, I think I have just discovered a new-found passion for writing (Please excuse my grammar mistakes.) Anyway, I am happy that Byredo has made this unusual perfume. Ask for a sample when you walk by a Byredo counter!